Is linking WASH and nutrition the new math? It is already known that malnutrition is often caused by unsafe water and sanitation1. But how can we move from current silo-thinking and establish fruitful (multi-stakeholder) partnerships and projects to truly realize the human rights to food, water and sanitation? In many low and middle-income countries, people who suffer from food and nutrition insecurity are to a large extent the same people who do not have access to safe drinking water, sanitation and hygiene (WASH)2. The SDG framework aims to end all forms of hunger and malnutrition (SDG 2) and to provide safe access to WASH (SDG 6) for all by 2030. For this, improving synergy and integration between thematic areas of WASH and nutrition is imperative in order to increase impact and sustainability of interventions. In this context, on January 14, 2019, the Dutch Ministry of Foreign Affairs (Water and Food Security cluster of the Inclusive Green Growth Department, together with the Department for Stabilization and Humanitarian Aid) organized a workshop on “WASH and Nutrition”. The goal of the workshop was to provide insights into the opportunities for integrating WASH and nutrition, and how the integration can be used and optimized in programs and projects. The workshop included practical examples and an interactive session with an experienced panel on integrating these themes. In total, 65 people participated from government, NGOs, knowledge institutes and some private sector. First, Jona Toetzke, Project Coordinator WASH & Nutrition of the German WASH Network, introduced the recent publication 2 + 6 = 17 , focusing on the health-related link between WASH and nutrition. The 2 + 6 = 17 publication stresses the global promise of leaving no one behind in the SDG framework, while huge challenges remain in both the area of nutrition (SDG 2) and WASH (SDG 6). The publication calls for the utilizing of synergies between goals or fields of action to increase efficiency and effectiveness. Suggested is to use SDG 17 that defines explicit targets and indicators to revitalize and enhance global partnerships in an effort to mobilize all available resources until 2030. The publication highlights the status quo of recent research, current policy and knowledge gaps as well as suggested recommendations for action, supported by concrete examples. Find the presentation here. So what can we say about the link? There is a growing body of evidence that suggests that the WASH environment can be critical in shaping children’s nutritional outcomes1,2. The 2 + 6 = 17 report also shows that while a clear link between WASH and undernutrition can be found, research on the impact and efficiency of WASH interventions on nutrition is still limited and shows various results. This also came forward in the discussion on the recent SHINE WASH Benefit studies, that stresses that WASH alone cannot prevent childhood linear growth faltering. This particular study found no effect of WASH intervention on length/height-for-age (chronic undernutrition) either alone or in combination with the infant and young child feeding intervention. Possible reasons for these findings as suggested by the authors could be that the WASH interventions used were not effective enough to facilitate linear growth and reduce diarrhea, or the trial did not address inter-generational prenatal determinants of stunting (chronic undernutrition). This suggests, as also the 2 + 6 = 17 report and the dialogue between stakeholders did, that more research is needed and also on the question of “why it is ineffective” to gain further insights concerning failures in the complex behavior intervention chain. The presentation of Mark Ellery, Water, Sanitation & Local Governance Consultant suggests that currently there seems to be an overreliance on measuring diarrhea and certain sanitation practices as an indicator for both acute (wasting) and chronic undernutrition (stunting). While emerging knowledge suggests that poor hygiene behavior resulting in constant faecal exposure is not necessarily accompanied by diarrhea. This constant exposure impacts the intestine resulting in a failure to absorb nutrients leading to chronic undernutrition (environmental enteric dysfunction, which can lead to stunting). Therefore, Ellery suggests that using the right measurement and finding the right proxy indicators is key. Different means to manage chronic versus acute faecal exposure risks are needed. For instance, while end-point water testing might enable us to say something about chronic exposure, it doesn’t mitigate acute exposure risks – and while water safety planning is useful to manage acute exposure risks, it doesn’t quantify for chronic exposure levels. Fortunately, there is an increasing number of organizations that are either considering, promoting or already implementing WASH-Nutrition projects. Riad Mahmud, country director of Max Foundation Bangladesh, explained about the Max Healthy Village project. This project aims to give children under five a healthy start in life by reducing stunting and the incidence of faecal- and water-borne diseases. It is an integration of WASH, Baby-WASH, nutrition, health care for mothers and children, and local governance. Communities, and especially the parents, the local government as well as private sector have partnered to ensure long-term sustainability. In this concept, good hygiene is made a matter of local pride. If a village meets six benchmarks of healthy practice and sustains the change for a year, it is declared healthy by local government officials and a sign is proudly placed for all to see. Initial findings from a Max Healthy Village pilot study between 2015-2018 show that stunting significantly reduced from 48% to 18%. Furthermore, it was found that stunting further reduced when an integrated approach of WASH, nutrition and sexual and reproductive health (SRH) was incorporated. Find the presentation here. Muluneh Bimrew, Program Manager of Plan International Ethiopia, explained about the project “Water, the key to a better future”. This is an example of a WASH-FNS integrated project on water, sanitation and food security since October 2013. The aim of the project is to reduce morbidity, mortality and malnutrition of children, caused by waterborne diseases and malnutrition in two districts in Ethiopia. The main focus of the project is on Multiple Use Water Services (MUS), Sanitation & Hygiene promotion (through Community Led Total Sanitation (CLTS) approach), Economic Empowerment (through village savings and loan groups) and nutrition promotion. The project is addressing multiple challenges of sanitation and hygiene including the reuse of nutrients from toilet wastes and recycling of water for agricultural production. The project shows promising results on both WASH and nutrition practices. Besides access to food/nutrition and WASH; MUS also creates space for women empowerment, reduce women household burdens, and increases education quality at school. Find the presentation here. The link between WASH and Nutrition deserves particular focus in humanitarian crises. If undernutrition is already prevalent, WASH services are of utmost importance in order to prevent an increase in persons affected by wasting (low weight for height) and increased mortality. In times of crisis, Unicef coordinates immediate relief to those in need, for both WASH and Nutrition. Unicef aims to work intersectorally by valuing WASH as a contribution to education, health, nutrition and other outcomes. For example, in 2017 the Unicef nutrition and food security clusters identified over 100 districts in Yemen at high risk of famine. The Unicef WASH and health clusters agreed with this prioritization and agreed to work together with the other clusters in these districts. 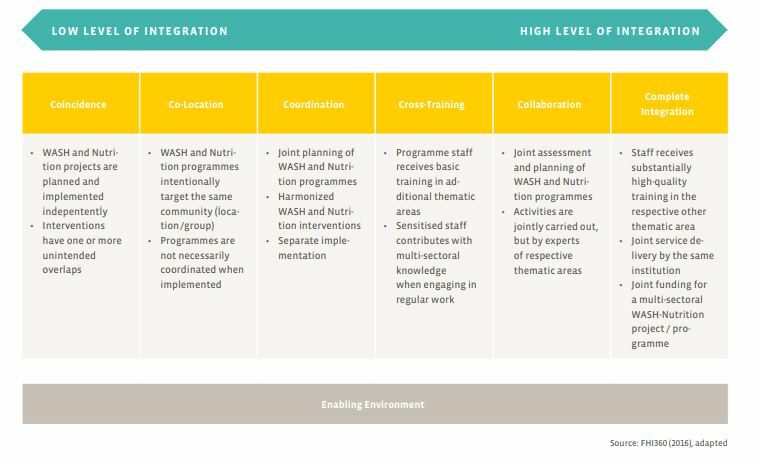 In the development context, the pilot program “SanNut” was implemented in Kenya, integrating nutrition-related behaviors into a Community Led Total Sanitation (CLTS) program. The SanNut program was designed to address the gaps in CLTS that primarily focuses on adult sanitation and hygiene with limited mention of healthy toddler sanitation practices. Adding yet another component on nutrition behavior in the CLTS program did not seem to compromise the indicators compared to a comparison group. These findings highlight an opportunity to integrate nutrition messages with CLTS to directly impact child health by addressing childcare practices drawn from sanitation and nutrition programs. Find the presentation here. Unicef speaks of different levels of integration from no integration to convergence to ultimately synergetic programming (including joint analysis, development, reporting and fundraising). Different levels of integration are also included in the 2 + 6 = 17 report, suggesting that the choosing of the appropriate level of integration is a strategic decision, which should be informed by an analysis of the expected costs and benefits of the various options2. Lizette Burgers, Senior Advisor on Sanitation and Hygiene from Unicef stated that it is important to ensure that WASH is a key component of malnutrition reduction programs, but more investment is needed to move from convergence to synergistic programming. Some key lessons for successful integration were highlighted by Roel Blesgraaf, WASH advisor and coordinator of the Netherlands Red Cross (find the presentation here). These principles were shared during the WASH and Nutrition Summit in Paris in 2017 and adopted from the BabyWASH Program Guidance Document. There is no one-size-fits-all way to do integration, however, 10 principles are suggested to support a better chance for success and help to move organizations along the continuum of integration. Such as building of consortia with expert organizations and making use of existing platforms, or the connecting to integrated government frameworks and to focus on strengthening the evidence base. During the break-out session of the workshop, experts shared similar statements but also highlighted that the defining of potential synergy between WASH and nutrition is dependent on the context. Furthermore, participants felt that a positive stimulus for cooperation was needed which could be facilitated by policy. As in practice already many examples exist, the missing link might be on policy level? Furthermore, knowledge management should be better incorporated in programs and knowledge sharing better facilitated at the local level. Paul van de Logt from the Dutch Ministry of Foreign affairs stated in his closing remarks that it would be interesting to look at the “new equation” and he feels that the ministry is challenged by the discussions during the workshop to explore possibilities to work on programs where SDG 2 and SDG 6 are more combined. Van de Logt also recognized that it is important to take time to start small and learn from experiments in doing differently, while at the same time wondering how to reach the full scale of the SDGs. This “recipe for success” report already suggests concrete recommendations to policy-makers on how to integrate water, sanitation and hygiene into actions to end malnutrition for large-scale investments and impact. For example, it is suggested that donor agencies should promote and fund multi-sectoral approaches and prioritize flexible financing, capacity-building and convening power. Besides, more joint analysis and cross-sectional research is needed to inform policy and practice to develop this agenda further and build on lessons learned. Annegré de Roos from the Netherlands Working Group on Nutrition (NWGN) and Jona Toetzke from the Sanitation and Water for All (SWA) WASH-Nutrition Working Group illustrated that there are already multi-stakeholder platforms that can be used for learning from each other and sharing of knowledge for evidence-based activities. Copyright © Max Foundation. Alle rechten voorbehouden.